A busy, hardworking bathroom doesn't have to look utilitarian. Enter the Mesa Mission Double Vanity, with two sinks plus plenty of counter and drawer space -- all drawn together in a sleek, airy silhouette. Shown with a glossy granite top, the quality of this vanity resists aging as well as the style does. Fold your fluffiest towels under the sinks for easy access, or choose to accessorize this striking piece with bud vases, a collection, or even add more covered storage with classic wicker baskets tucked into the shelves. Go ahead and make this versatile vanity a more decadent part of your morning routine. Sharp, modern curves define this vanity cabinet, while the open storage base gives it a breezy quality that's hard to find in larger pieces. Constructed in your choice of solid wood, this vanity is destined to last a lifetime. Design this Amish vanity cabinet to your own configurations by contacting one of our furniture specialists for a custom furniture quote. 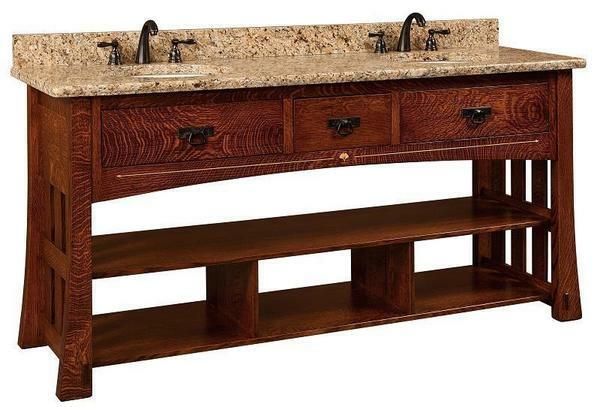 Call with questions on our Amish bathroom vanities that are all solid wood.